This release xili-language 1.2.1 adds new features dedicated to multilingual theme’s creators and webmasters. Some new php functions, a folder to include functions shared by themes (not necessary to put functions in functions.php of the current theme); example with a shortcode to insert link inside content toward another post in a language. 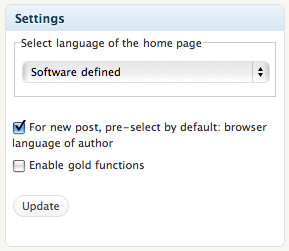 Since this release, xili-language is also compliant with wordpress 2.9. In sidebox « Settings », a new check button appears if a folder named xilidev-libraries and containing a functions.php file was present inside your wp/content/plugins/ folder. If this button is checked, all the functions inside this file was added when plugin is activated. Why it is interesting ? When adding here special filters or actions for hookable template tags of xili-language, you don’t need to copy and paste your functions of one theme to another theme. xiliml_get_lang_object_of_post($post_ID) Return an object containing properties of the language set to the post passed as param (false if the post don’t exist or undefined language) See code for more infos. xiliml_get_language($lang_nameorslug="") Return an object containing properties of the language passed as slug (ex fr_fr) or name (ex fr_FR). False if the language doesn’t exist. $result->description gives the full name of the language set by you in xili-language settings. To illustrate these new features, please find an example of functions.php here containing only two functions to create a shortcode named linkpost. Please find here a .zip containing the folder « xilidev-libraries » to upload in wp-content/plugins/ directory and this example functions [enriched since Feb 28th, 2010]. Ce contenu a été publié dans Experts corner, xili-language, avec comme mot(s)-clé(s) designer, multilingual theme, php, webmaster. Vous pouvez le mettre en favoris avec ce permalien.